2016 was another memorable year for the development of professional audiovisual technology. The following is a selection of some of the innovative new offerings that have helped propel the industry forward this past year. The DigitalMedia DM-DGE-200-C is a compact, low-cost, and versatile meeting room solution for multiple applications. It offers auto-switching between HDMI and 4K/60 DM input, auto-display on/off, and H.264 decoding, IR control, and direct connectivity to Microsoft Exchange and Crestron Fusion Cloud via the LAN port for room scheduling and data collection. The DM-DGE-200-C features a built-in graphics engine to generate custom welcome screens and messaging and to provide Crestron control graphics and web browsing for the Crestron TSD-2020 20-inch touch display, or for a third-party large-format touch display. DisplayNet is a new concept for AV distribution that leverages 10GbE ethernet technology to switch, extend, and distribute uncompressed AV signals in real time with resolutions up to 4K (UHD). DisplayNet delivers scalability, versatility, and reliability with zero frame latency, zero compression, and zero artifacts. DisplayNet supports a wide range of applications including point-to-point extension, limitless matrix switching, video wall display, and multiviewer. Biamp Systems’ TesiraLUX introduces low-latency, 4K-networked video capabilities to the Tesira ecosystem with the addition of AVB/TSN-enabled video encoders and decoders. This solution transports both audio and video signals over a single network through the reliability of AVB/TSN. Tesira, with TesiraLUX, is the only network AV solution on the market today that can handle both audio and video processing, according to the company. The TesiraLUX product line includes an AVB video encoder (TesiraLUX IDH-1) and an AVB video decoder (TesiraLUX OH-1). The encoder features one HDMI port, one DisplayPort port, and two mic/line-level analog inputs. The decoder includes one HDMI port and two line-level analog outputs. The 70-Inch 4K Mondopad Ultra (INF7023) is an all-in-one videoconferencing, interactive whiteboarding, presentation, and data-sharing display for teams, providing collaboration across the conference table or across the globe. The Mondopad Ultra product line delivers UHD 4K clarity with easy operation and enterprise integration right out of the box. The feature-rich, generously sized 70-inch Mondopad Ultra is the first to combine projected capacitive touch technology with 4K screen resolution resulting in the best image clarity, sleek industrial design, and intuitive multi-touch capabilities for professional and education environments. A new high-performance in a compact digital mixer, the TouchMix-30 Pro has the features and functionality to satisfy demanding professionals while also providing an intuitive workflow that delivers results, quickly and easily, to users at every level of experience. Well suited for production professionals, musicians, and bands, as well as live performance venues, its 32 mixing channels (24 mic/line, six line, stereo USB) and 16 outputs offer signal management flexibility for a wide range of applications while a host of additional, new “pro” features sets TM-30 Pro apart from its smaller siblings. EAW RADIUS is a family of loudspeakers for both portable and permanent installation applications. RADIUS brings EAW’s acoustical technologies like EAW Focusing and DynO to a new powered and processed platform that integrates Dante networking and iOS-based prediction, control, and monitoring. The series consists of 8-and 12-inch two-way point-source loudspeakers that are available in two horn patterns, a double 8-inch articulated line array, single 12-and 18-inch subwoofer models, and a 12-inch coaxial stage monitor. Middle Atlantic’s DC Power Distribution is a DC power solution designed to solve space and power outlet challenges in one universal device, eliminating messy, space-consuming wall warts and other power clutter. Available as 45W DC compact and 125W DC 1RU systems, it fits into any rack unit, small enclosure, or wall box. Key features include color-coded screw terminal connector platform, polarity labeling for multi-voltage outputs; multilevel protection on AC input and DC outputs; USB ports; and LEDs to indicate activity and maximum capacity on each voltage bank. Atlona’s AT-UHD-SW-5000ED is a five-input commercial-market 4K switcher that provides two HDBaseT inputs and mirrored HDMI/HDBaseT outputs, offering integrators more flexibility in designing boardroom, classroom, and other AV presentation systems. 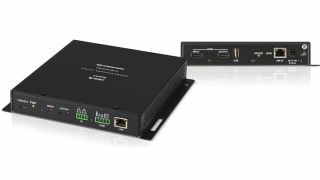 It supports 4K/UHD at 60Hz, 4:2:0 video (10.2Gbps) and transmits AV signals along with ethernet, PoE, and control over a single cable to displays up to 328 feet (100 meters) away. Built-in control options include auto-switching, front-panel buttons, and compatibility with IR, RS-232, or TCP/IP-based control systems. The Epson Pro L25000U installation laser projector is designed for high-impact live productions. Well suited for rental, staging, and other large-venue applications, this projector combines a laser light engine with inorganic components for high brightness and reliable, 24/7 operation—up to 20,000 hours virtually maintenance-free. Premium features include 25,000 lumens of color brightness and 25,000 lumens of white brightness, 4K-ready lenses, native WUXGA resolution with 4K Enhancement Technology, sealed optical engine, 3G-SDI, and HDBaseT connectivity. Installers can choose from eight optional lenses with powered lens shift and lens memory (sold separately). TeamConnect Wireless is a go-anywhere, portable wireless conferencing solution for up to 24 participants. The solution is made up of four units—one master and three satellites—that can be easily transported in a durable, easy-to-transport charging case. The units are wirelessly linked by a DECT connection and provide a flexible system that can be set up in virtually any room or table arrangement. It offers a variety of connectivity options for increased flexibility, including Bluetooth, NFC, and USB. TeamConnect Wireless supports multiple simultaneous audio channels, so additional callers can be joined to an existing conference by just connecting another device. The new 24S and 24S-D point source loudspeakers are the latest additions to the established xS-Series. Differing only in horizontal dispersion, each enclosure houses two 12-inch LF drivers in a dipolar arrangement and a single horn-loaded 1.4-inch exit compression driver. The HF horn is rotatable, allowing for either vertical or horizontal mounting. LF driver separation enables constant directivity control in the same plane as the dipole down to approximately 500Hz. With a frequency response extending from 55Hz to 18kHz, the 24S and 24S-D are versatile, all-in-one solutions for nearly any full-range application. The new RackWell Stage Pocket supports rack-mounted equipment like digital snake components and personal monitor modules, allowing them to be centrally located in the stage floor. Vertically install equipment in the RackWell to eliminate patch panels and extend digital throughput to other locations under the stage floor, instead of across it. Additionally, connectivity located on the face of electronic equipment is protected and accessed under the 11-gauge steel lid, allowing cables to egress onto the stage in an orderly fashion through hinged cable exits. The Leyard TWA Series fine-pitch LED video walls is a family of displays featuring low power consumption and high image quality. Available in 0.9, 1.2, 1.4, and 1.8 millimeter pixel pitches, the Leyard TWA Series delivers a pixel density and form factor similar to LCD and rear projection video walls, but with a seamless image that can be configured to nearly any size. The unique 54-inch flat panel design offers superior image quality, energy efficiency, and 24/7 reliability, making it well suited for both control room and digital signage applications. The Canon REALiS 4K501ST Pro AV LCOS projector includes a native 4K resolution of 4096x2400, up to 5,000 lumens, and Canon’s LCOS technology with AISYS-enhancement for high-brightness and detailed image reproduction. The REALiS 4K501ST also offers a genuine Canon 4K lens and a robust collection of advanced image adjustment and professional install setting features, including marginal focus, which helps ensure content projected on the peripheral portions of domed surfaces remains in focus. The REALiS 4K501ST includes two HDMI version 2.0 inputs with HDCP 2.2 support. RGB Spectrum’s Zio networked AV products deliver seamless AV over IP, replacing traditional dedicated switchers to deliver real-time video and audio over any size network. This intuitive, scalable, network video distribution and control system features powerful admin tools and an easy-to-use GUI with drag-and-drop capabilities and live thumbnails. Zio endpoints attach to a standard 1Gig ethernet switch, with encoders that accept computer and video signals at resolutions of up to 4K (UHD) and single-or multi-signal decoders for feeding displays. Quantum Ultra is a modular 4K video wall processor featuring the Extron Vector 4K scaling engine and the new HyperLane video bus. which delivers real-time performance. A single 6U, 10-slot processor can support multiple video walls with mixed resolutions and screen orientations, providing flexible system design with minimal complexity and cost. Customizable output resolutions, output overlap, and mullion compensation provide compatibility with nearly any display technology. RS-232, USB, and ethernet interfaces provide direct connections for control systems. Quantum Ultra’s configurability, features, and performance make it well suited for nearly any video wall application. The Yamaha SWP1 Series of L2 gigabit advanced network switches have been designed specifically for sound installation and live sound networking, with simple dipswitch Dante optimization and comprehensive graphical interfacing via Windows application. A simple dipswitch setting is all that is required to optimize the L2 network switches for Dante operation. The dedicated Windows application provides “network visibility” for comprehensive monitoring and control. The SWP1 simplifies switch configuration by having settings for QoS, IGMP snooping, and other parameters preconfigured for optimal Dante performance. Audio-Technica’s ATND931 gooseneck and ATND933 hanging microphones include A-T’s Dante-enabled ATND8734 ceiling-mount power module to give users a cost-effective solution for integrating microphones into a Dante network. Available in three different polar patterns (cardioid, hypercardioid, and MicroLine) with black or white finish, both microphones terminate in a TA3F-type connector for attachment to the power module. The power module includes a switchable 80Hz low-cut UniSteep filter, three-position input gain level selector, red/green LEDs, and an RJ45 output jack for connection to the network via Cat-5e (or better) cable. Ashly Audio expanded its popular nX-Series of multimode amplifiers to cover applications where less power is needed. The new nX family models deliver 75W or 150W per channel in a single rack unit frame that can house either two or four channels. The nXe models add ethernet for monitoring and control. The nXp models feature the networking and built-in Protea DSP matrix processor, and optional Dante or CobraNet cards can be added to nXe or nXp models. These multimode power amplifiers allow users to drive low impedance (2, 4, 8 ohms), or 25V, 70V, 100V constant voltage systems output via rear panel dipswitches. CDD-LIVE includes three full-range powered models (CDD-LIVE 8, CDD-LIVE 12, and CDD-LIVE 15) and two subwoofers (CSX-LIVE 118 and CSX-LIVE 218) that cover nearly all professional standalone and distributed applications for sound reinforcement and installation. Martin Audio’s patented Coaxial Differential Dispersion technology combines the “point-source” benefits of coaxial design with the consistent coverage of Differential Dispersion to project sound evenly front to back, with wide horizontal coverage close to the speaker. Onboard Class D amplification, DSP, and Dante Digital Audio networking assure simplicity of stage setup and efficient installation. Christie Phoenix EP is a compact, scalable solution for managing content on single or multiple LCD panels. The Phoenix EP installs directly into compatible Christie displays—which also provide power—and connects directly to a network using Cat-X cable. One Phoenix EP processes networked sources, decodes, and manages audiovisual and data sources on up to two Christie flat panels. Phoenix EP streamlines system designs, and eliminates requirements for AV extension and distribution equipment. Digital Projection’s second-generation HIGHlite Laser projector, the HIGHlite Laser II, combines the award-winning capabilities of the first generation with valuable new benefits. Combining 13,000 lumens brightness with 20,000 hours of operation from the laser-hybrid illumination source, it provides a multipurpose, long-life display with the power to cut through all but the brightest ambient light. Increased installation flexibility allows for the HIGHlite to point up, down, in portrait mode, and all positions in between. Built-in edge blending and projector control software allow for the easy creation and maintenance of massive blended imagery. I SERIES is a family of high-performance, arrayable loudspeakers with exceptional musical quality and vocal clarity. Community has introduced three compact models that match the performance, appearance, and voicing of the larger I SERIES loudspeakers for distributed applications, spot-fill, or as main loudspeakers in smaller spaces. Compact I SERIES come in textured black, white, or custom colors as one of several configure-to-order options. U-Brackets, vertical yokes, a 70V/100V autoformer, and weather-resistant versions are also available. The SmartMount Supreme Full-Service Video Wall Mount (DSVW775) is designed for simple, tool-less micro adjustments for 1.5 inches of fine-tune adjustment on the X, Y, and Z axes. It features reusable display-dedicated wall plate spacers, which can be used for both portrait and landscape applications, and is 25 percent lighter in comparison to previous models. Enhanced cable management featuring new tabs on the scissor arms control cables for a clean aesthetic. The mount is also equipped with handles on the top and bottom that can be pulled for pop-out serviceability. The CBT1000 is an extension of JBL’s popular CBT column array loudspeaker line, offering greater output, deeper bass response, and more adjustability of the coverage pattern than was previously possible. The CBT1000 full-range cabinet and CBT1000E extension cabinet provide versatile, adjustable vertical pattern selections for aligning the coverage to the geometry of a room. Independent selection of four “pattern up” coverage angles and four “pattern down” coverage angles combine to provide 16 different vertical coverage combinations. The Matrox C900 is a single-slot graphics card to drive nine 1920x1200 displays for 3x3 and 9x1 configurations. C900 can deliver applications across one ultra-large desktop, making it well suited for digital signage installations in retail, corporate, entertainment, and hospitality environments, as well as control-room video wall solutions in security, process control, and transportation. Building on Galileo’s algorithms, Galileo GALAXY retains users’ favorite processing tools, including five-band U-Shaping and parametric EQ, while adding a new crosspoint delay matrix feature and improved delay integration, signal-to-noise ratio, and dynamic range. Galileo GALAXY lets users work smarter and quicker, whether it’s reconfiguring network audio routing, expanding the system, or integrating with AVB-capable network infrastructure. Three versions are available for different configuration needs: Galileo GALAXY 408, Galileo GALAXY 816, and Galileo GALAXY 816-AES3. LG’s Dual-View Flat OLED display is a paper-thin, dual-sided display with deep blacks and vivid color. The space-efficient, two-sided design provides customers with three different installation options: ceiling suspension, wall-mount, and floor stand. Each screen features 4K (UHD, 3840x2160) resolution for a lifelike viewing experience to capture consumer attention. High-performance system-on-a-chip (SoC) and an internal memory capacity enable ideal UHD-synced playback without the need for PCs or media players. The display also has the ability to swap and mirror content on each screen with a simple press of a remote control button.